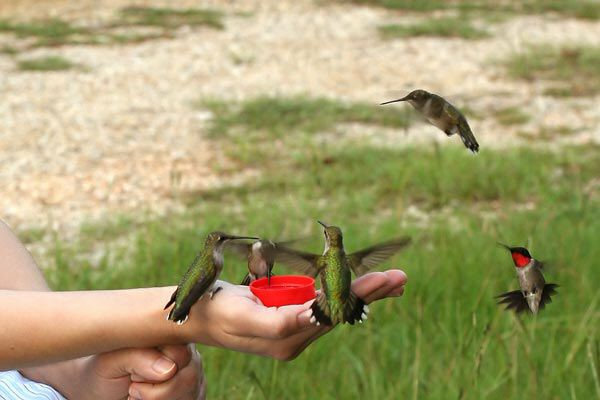 In September 2006, Abigail Alfano of Pine, Louisiana, trained these ruby-throated hummingbirds to feed from her hands. These hummingbirds had been visiting her hummingbird feeder. I’m envious, but I don’t have her patience. These are Alfano’s photographs. My friend Jane knows I like hummingbirds so she emailed these photographs to me of a woman hand feeding ruby-throated hummingbirds. I immediately suspected photoshop! And not just because I didn’t believe hummingbirds would feed from a woman’s hand — hummingbirds are territorial and don’t “hang out together.” I guess they do when they’re migrating. I immediately searched for a snopes.com article on hand-feeding hummingbirds, and amazingly it’s true. These hummingbirds live in Louisiana, where the motto is the Cajun term laisse le bon temps rouler, let the good times roll. Here, they hang out on their own Bourbon Street before they head onto southern Mexico for the winter. Peaceable kingdom in Louisiana. Usually, ruby-throated hummingbirds will fight off rivals at the feeder, but here they are hovering together and also overlooking the fact that a human is literally handing out the treats, a cup of sugar water. Wow, that’s either one powerful camera you’re using, or they left the shutter open for awhile…it’s very hard to capture hummingbirds like that, very Print-worthy pictures. The cropped version is really nice, as it focuses on the main area of the picture. Those are great photos. I wish I would have taken them and I wish I had that many hummingbirds in my yard! I did get some good photos of hummingbirds at my feeder in my two posts on hummingbirds — although they aren’t as great as these. Those hummingbirds may be on their own Bourbon Street, but I bet they’re sipping those oh-so-red Cosmos! Yeah I’ve heard it’s very hard to photograph them just right (unless you know a lot of tricks), because they’re so fast and if they manage to stay in stationary-flight just long enough for the camera to get a good shot, their wings may mess up the shot to the extraordinary speed they move at. They truly are the Royalty of the Avian-World. Thanks to Birds and Blooms Magazine, it is now known how she was able to accomplish this amazing task. The five steps that follow were told to the magazine by Abigail Alfano, but I have put them in my own words. 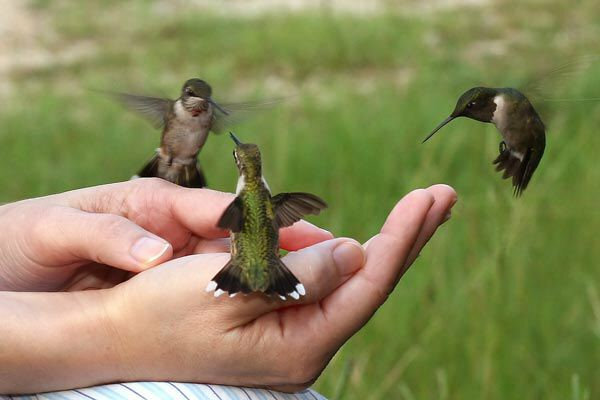 It truly amazes be that someone could actually get hummingbirds to feed from their hand. Personally, I don’t think I would ever have the patience for doing this. Nevertheless, I do love hummingbirds. Thank you, Abigail Alfano, for sharing with the world the steps of how you accomplished this remarkable task and also your personal photos of the event. What you have done is truly remarkable! You have also given others the hope that they too can accomplish this amazing feat as well. If you would like much more information about hummingbirds, please click the links below. The sites contain many articles about hummingbirds, video clips about hummingbirds, an informative tips booklet on hummingbirds, and much more. How did I miss this post? Love this! Enjoyed an amazing TV show a few nights ago about hummingbirds. We have quite a few that come to our feeders, & I enjoy them immensely. I didn’t know that there were so many different types of hummingbirds. I agree that it is amazing that such a small simple little being can get you so excited! However I have not been so lucky to have captured beautiful photo’s like you managed at your feeder, I’m not quick enough, my photo’s are always fuzzy. Since they are hummingbirds, would it be more appropriate to call them a choir of hummingbirds? My son hand tamed hummingbirds by sitting still and wrapping his fingers around their feeder. It is a thrill to feel how strong those threadlike feet of theirs grip and how those powerful little ” jet engines” buzz all up your arm! I was too lazy to stand by their feeder one day, so I set it on the arm of my chair. It didn’t take them long to find it. Then I added a tiny drop of red coloring to sugarwater I placed in a shotglass. I sat and held that little glass on the arm of my chair. One brave male came regularly to perch on my finger for his “shot”. the others hovered nearby, but he wouldn’t share. I recommend safety glasses if you attempt this. Those long sharp beaks hovering within an inch or two of your eyes is a bit unnerving. One bird flew up and hovered so close to the side of my eye, I could feel the wind of its wings next to my eye. They are very curious, and once they know you, they are very friendly, will perch on you, and will even become pesty at times. Lovely birds. Fantastic shots. You are lucky to have such beautiful creatures in the US, Look after them !! Beautiful birds, lovely pictures. You capture the beauty of hummingbirds. Thanks for sharing one of the wonderful works of God’s mighty hand. I appreciate you stopping by My Journal of Praise and liking a post. God bless. I once saved a hummingbird trapped in spiderwebs in a window. It was exhausted and I brushed the webs off and petted it lightly, it finally caught it’s breath and flew off. I bet not many people get to pet a hummingbird. That’s really cool. I’m glad you saved that little bird and got to touch it. A couple of years before my dad died he ‘convinced’ the local Sparrows to eat from his hand. Every day for a year before they would trust him to eat out of his hand! This went on for a couple of years until he died suddenly. For about a year the Sparrows would sit outside the back door and call to him. Broke my heart. That is so heart-warming and sad at the same time. Beautiful post. Glad to have witnessed such clear pictures of something I didn’t think would happen. And yet, there it is!